The Fairfax County School Board has approved a measure late Thursday night to change the name of J.E.B. Stuart High School in Falls Church. WASHINGTON — The Fairfax County School Board has approved a measure late Thursday night to change the name of J.E.B. Stuart High School in Falls Church. 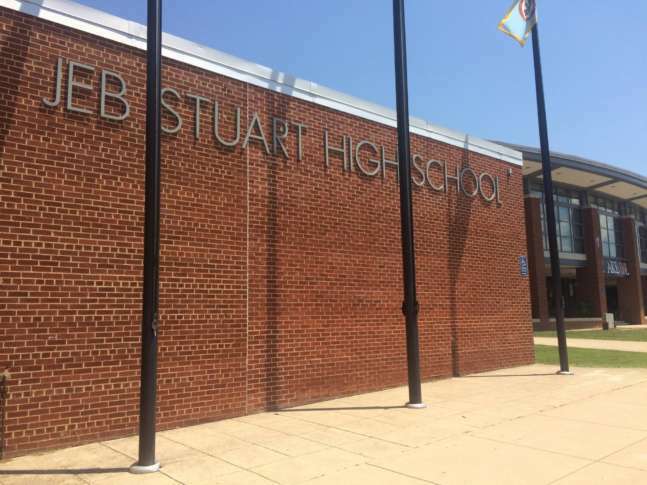 The measure requests “that the Stuart community consider ‘Stuart High School’ as the new name,” but the exact new name has yet to be decided.The renaming process will start this fall. A name change would take effect no later than the beginning of the 2019 school year. The Falls Church school, which is named after a slaveholding Confederate general, opened in 1959. Last July, the school board created a working group to look at the pros and cons of a possible name change and to figure out if there is community support for it. Two years and numerous community meetings later — many of which included loud outbursts and protest signs — board members finally voted on the issue during Thursday night’s meeting at Jackson Middle School in Falls Church. An alternative motion Thursday night to delay the vote failed. Those in favor of a name change had said it must be done to reflect the school’s diversity and promote a welcoming atmosphere. Those in the “keep the name” camp had pointed to a survey done in 2016 that found just 35 percent in favor of a name change and cited hefty cost estimates involved in the name change. In 2015, actress Julianne Moore and Hollywood producer Bruce Cohen, who went to the school, launched a petition calling for a name change. The petition, which has more than 35,000 supporters, calls for the school to be renamed in honor of Supreme Court Justice Thurgood Marshall. The school board chose the name in 1958, when Virginia was embroiled in what became known as Massive Resistance to federal desegregation efforts, The Associated Press reports. The debate over the school name comes as the national question of how to honor Confederate heroes, if at all, is flaring up again. In New Orleans, Richmond and elsewhere, civic leaders have weighed removal of Confederate monuments.